InfoAtoms is an ad-supported program that is promoted at infoatoms.com. This suspicious program is identified as a security threat, and most browsers block its installer. Unfortunately, not all users install security updates or upgrade their browsers, which allows the ad-supported program to slither in anyway. Most users expect this program to help them browse the web in a more advantageous manner, but they soon realize that InfoAtoms is an unreliable ad-supported program that requires removal. If you want to learn how to delete InfoAtoms from your operating system, please continue reading this report. The suspicious InfoAtoms is compatible with Google Chrome, Internet Explorer, and Mozilla Firefox web browsers, but, as mentioned before, they usually block the installer of this ad-supported program. Of course, if your operating system is not protected and you are using old versions of these browsers, you might install InfoAtoms hoping that it will provide you with beneficial services. This ad-supported program is supposed to show links that provide more information when you highlight words. Even if this function were to work, we still recommend removing InfoAtoms because of the suspicious ads that it injects. Our malware researchers have found that InfoAtoms can introduce users to suspicious pop-ups and commercial advertisements. Interacting with this content can be dangerous because the advertisers responsible for it could be unreliable. If you do not remove InfoAtoms, ads could be used to route you to unreliable sites or even expose you to scams. Even though we cannot claim that all ads associated with this program will be unreliable, you cannot dismiss this possibility because it is your virtual security that is on the line. If you want to eliminate all security threats, you need to delete InfoAtoms from your operating system and browsers first. This should be followed by the removal of the remaining threats. Even though InfoAtoms can be recognized as a standalone program, it is possible that this program will be installed packaged with other programs. If that happens, you have to make sure that the programs installed on your PC are not malicious. If they are malicious, you must remove them as soon as possible; otherwise, you might encounter different kinds of security problems. While InfoAtoms is only dangerous because it showcases suspicious ads, other threats could be more aggressive. If you cannot identify which threats require removal, it is important that you utilize a malware scanner to inspect your PC. 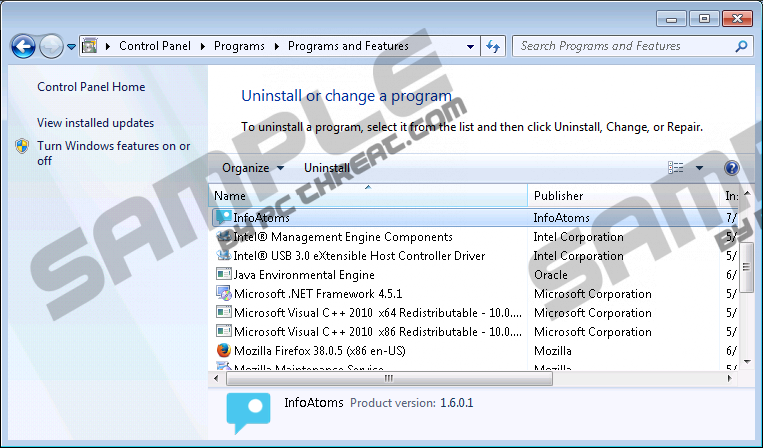 If you choose to uninstall InfoAtoms from your operating system manually, you will need to find and delete the extensions that belong to this adware. Our manual removal guide below shows all the steps that you are required to take if you want to delete InfoAtoms successfully. When it comes to the removal of third-party programs, we cannot advise you on that because we do not know which threats you need to delete from your operating system. You can always use a scanner and research the threats detected, but it is much easier to install a security tool that will not only protect you in the future but will also automatically remove all malicious programs and their files. Right-click the app you want to delete. Move to Toolbars and Extensions. Quick & tested solution for InfoAtoms removal.